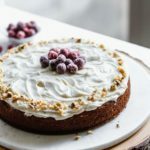 Similar to a carrot cake yet with a unique flavor all its own, this parsnip cake is sweet, spiced, and topped with a velvety cream cheese frosting. Parsnip cake! It’s a thing, a very delicious thing. You probably haven’t had one before (or maybe you have; you’re more worldly than me). But I’m here to tell you that it’s delicious and you should stop what you’re doing and make it immediately. I don’t think I ate parsnips growing up – or at least if I did, they didn’t make an impression on me. I first started eating them with regularity in law school, when I saw curious “white carrots” pop up at the grocery store in wintertime. That was around the time I had finally learned how to properly roast a vegetable (i.e. to roast them at high heat so they become crispy, caramelized and delicious rather than sad, soggy and steamed). I was determined to roast anything and everything – carrots, brussels sprouts, (kale chips anyone? ), zucchini, potatoes – it all got thrown in the oven at 425. 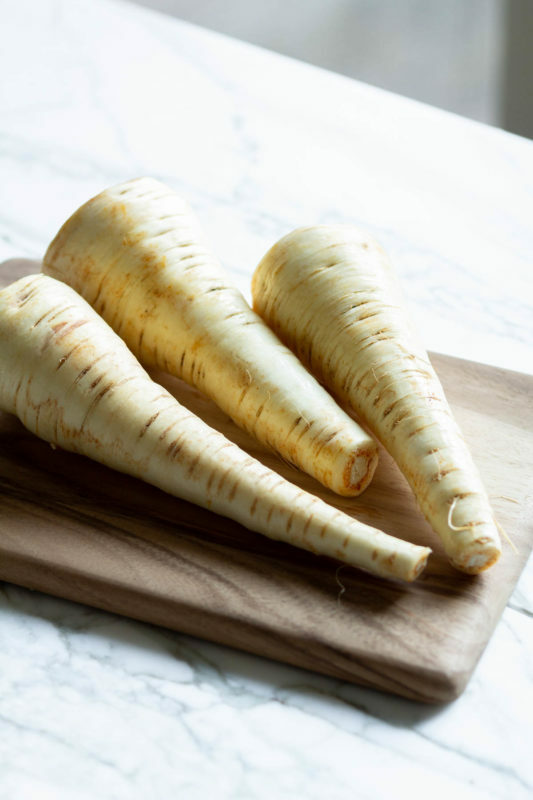 I discovered, however, when I tried parsnips for the first time, that they were much sweeter than the other root veggies, but also had a complex earthy flavor to them that I loved. Since that time I’ve eaten as many parsnips as I can get every winter, for it seems they’re the best during that time even though they’re technically available year-round. Parsnips are delicious roasted, but they’re actually amazing mashed too, prepared exactly as you would mashed potatoes (I also add a little lemon juice for flavor). They also go well in soups and stews. You prepare them exactly as you would a carrot – trim off the stem and peel, then chop and use however you want! 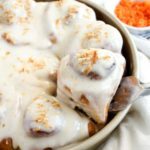 When Imperfect Produce sent me a bag of them in a recent box, however, I was suddenly inspired to do something completely different: a new take on my favorite dessert ever, carrot cake. 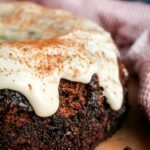 (Note: for all the iterations of carrot cake and carrot cake-inspired recipes I’ve come up with so far, click here). I grated the parsnips, used some warming spices (more emphasis on ginger than cinnamon since, well, it’s winter and we need it), put it in the oven, and hoped for the best. I figured since the texture and flavor profiles of parsnips and carrots are similar, a parsnip cake might just work. I don’t mean to pat myself on the back here, but — well who am I kidding, I’m going to pat myself on the back for this one. 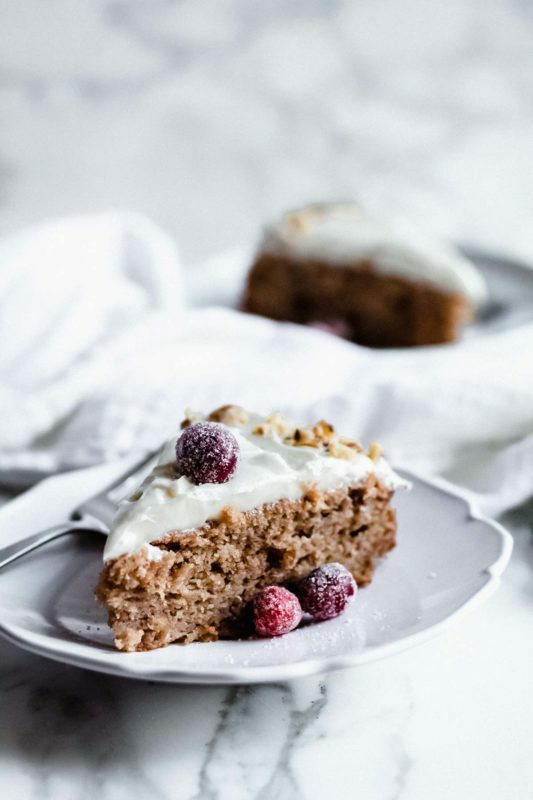 This parsnip cake is really, really good. Then I made it better by adding cream cheese frosting, because we all know cream cheese frosting is the best. 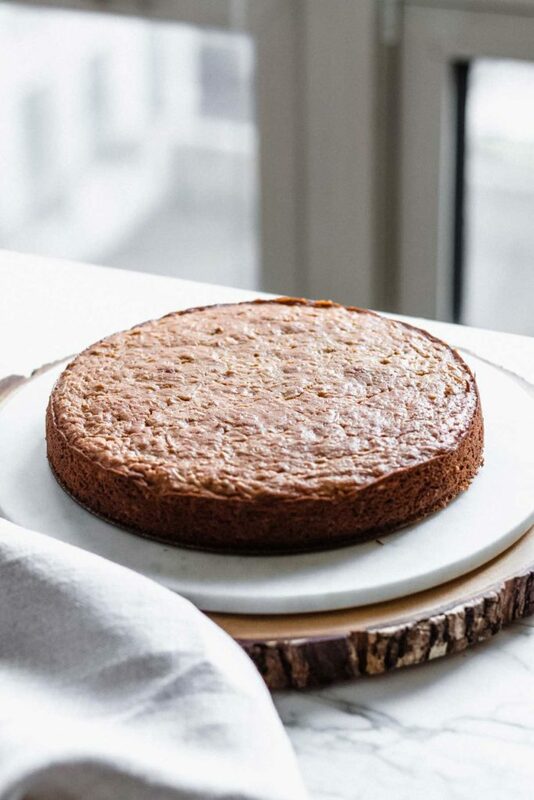 The earthy, sweet flavor of the parsnip shines in this cake, and the spices complement it perfectly. 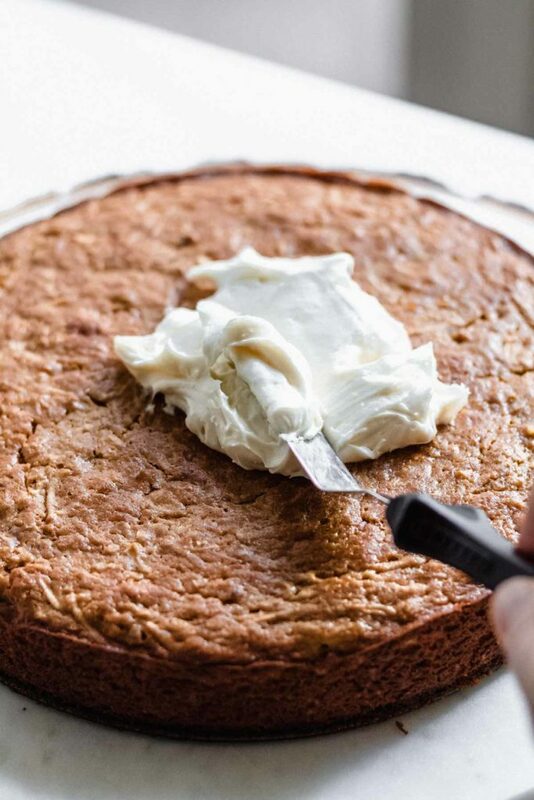 The sweetness of the cake is offset by the tang of cream cheese frosting. 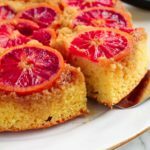 It’s that tang that makes it so addictive when paired with sweet baked goods, but it also adds intrigue and complexity. Basically, I could put cream cheese frosting on anything and probably be happy. Use a springform pan or a 9″ round pan with at least 2-inch high sides. 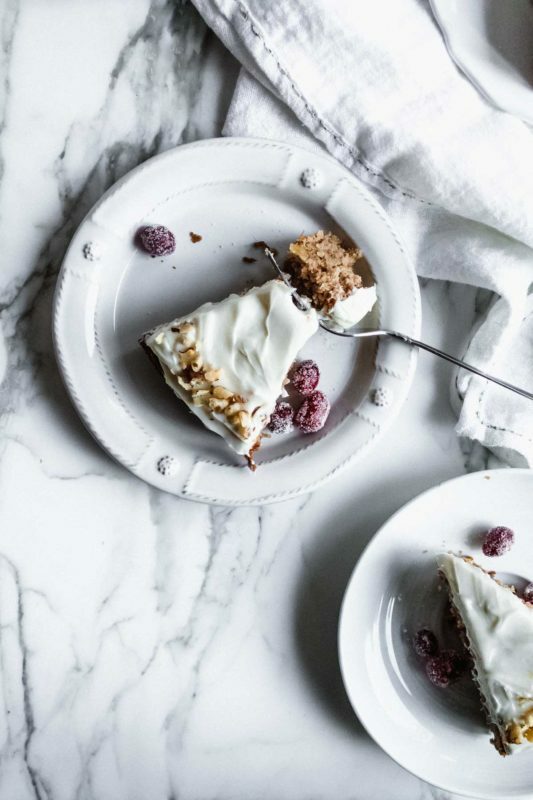 This will ensure you get a flat rather than rounded cake, and since this cake is a little taller than a typical layer, it’s a good insurance policy. I like using a springform pan because it’s easier to cleanly release the cake. Grate the parsnips finely, either by hand using a box grater or with the grating blade of your food processor. This will ensure that they bake fully in the cake and aren’t still crunchy. You only need about 2 medium parsnips to yield 2 cups grated parsnips, so it doesn’t take too long to do it by hand. Whisk your dry ingredients to combine before adding to the wet, so the spices are evenly distributed through the batter when you combine with the wet ingredients. Don’t use a mixer for the cake batter. I’m serious, just a fork (or a whisk) will do. We don’t want to over-mix the dry and wet ingredients once they’re combined – just stir until a smooth batter is formed. More mixing = more gluten formation = less tender cake. Using a mixer makes it very easy to over-mix. You don’t need it here! 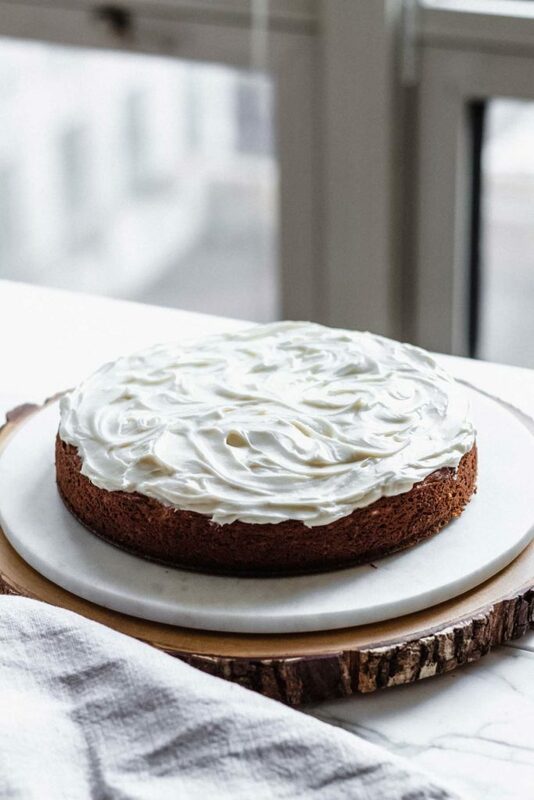 Do use a mixer for the fluffiest, lightest cream cheese frosting. You want to really beat air into the butter and cream cheese mixture to get that fluffy texture! I use my small hand mixer and it works perfectly for this. You can also use the whisk attachment of your stand mixer, which is designed to incorporate air into things. 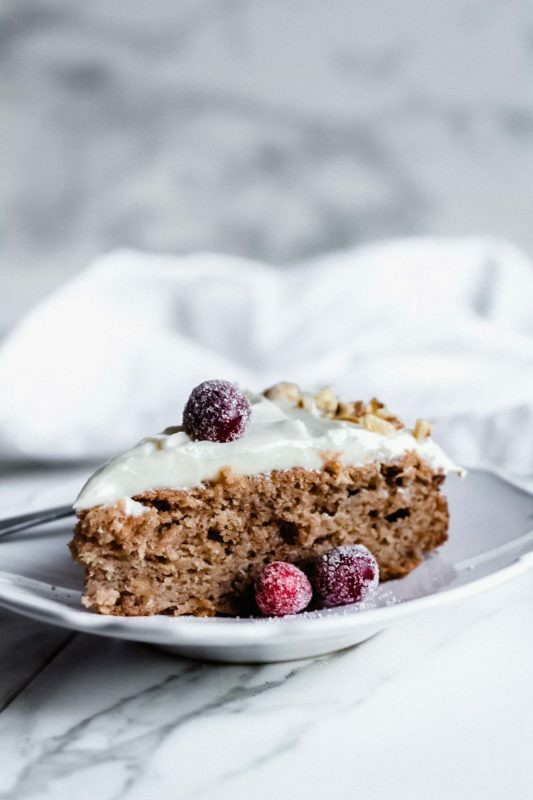 I hope you give this parsnip cake a try, even though it’s unusual. The flavor is complex and unique, and the soft texture is a comforting way to end a cold winter day – preferably on the couch, under a blanket, with Netflix easing you to sleep. Winter life isn’t so bad. Preheat your oven to 350 degrees F. Grease a 9-inch round springform cake pan, or a normal 9-inch round cake pan with at least 2-inch high sides. In a medium bowl, whisk the dry ingredients: flour, baking powder, salt, ginger, cinnamon, nutmeg, and cloves. Set aside. In a large microwave-safe bowl (I use a large glass bowl), or on the stove, melt the butter. Let it sit for a couple minutes to cool, then whisk in the brown sugar, followed by the eggs one at a time, then the Greek yogurt and vanilla, until combined and smooth. Fold in the grated parsnips and chopped walnuts until evenly distributed. 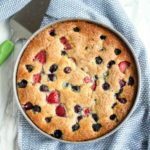 Pour the batter into the prepared pan, smooth out the surface, and bake for 50-55 minutes, or until cake springs back when touched and a tester inserted in the center comes out clean. Let cake cool in pan on a rack for 10 minutes, then remove the sides of the springform pan to release the cake. Let cake cool completely while you prepare the frosting. In a large bowl using a stand mixer with the whisk attachment, or a hand mixer, beat cream cheese and butter at high speed until pale and very fluffy – this should take 2-3 minutes. You want to incorporate as much air as possible into the mixture to make it light and fluffy. Add the powdered sugar, vanilla, and salt, and beat at medium to high speed until fully combined and light. 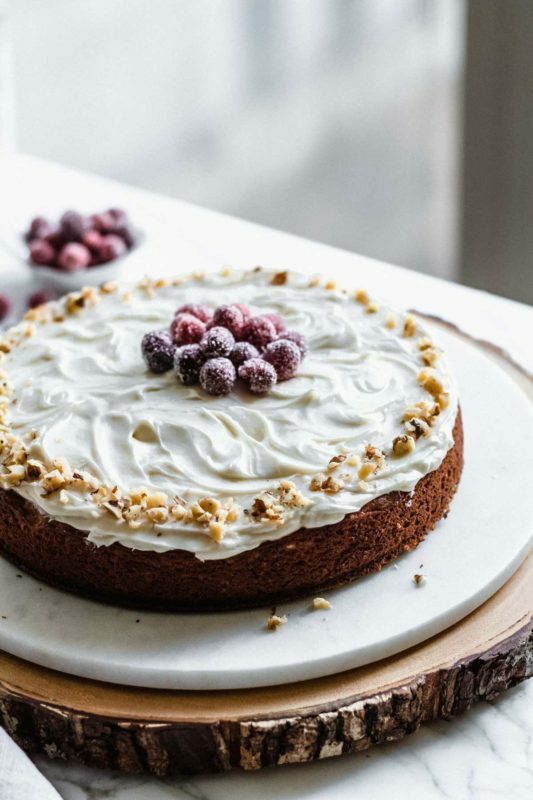 Spread cooled cake with cream cheese frosting. It should make a thick layer, and can be swirled in pretty patterns with an offset spatula. 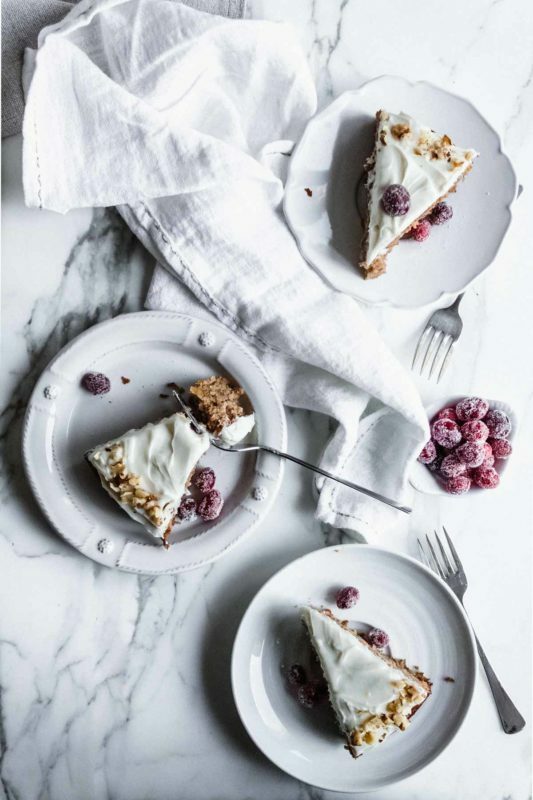 Decorate the outer edges of cake with sugared cranberries and additional chopped walnuts if desired. Serve! *I grated the parsnips by hand using a box grater, which sounds like a lot of work but doesn’t actually take all that long, since you only need about 2 parsnips to get 2 cups worth of grated parsnips. You can also grate them in a food processor with a grating blade. Recipe adapted, somewhat generously, from my single-layer carrot cake. Thank you to Imperfect Produce for sending me the parsnips I used in this recipe. All opinions are my own! If you want to sign up for your own Imperfect Produce deliveries, you can get 50% off your first box with code “katiebird”!